As you can see in the screenshot above you can get a browser and start testing in just 5 seconds. 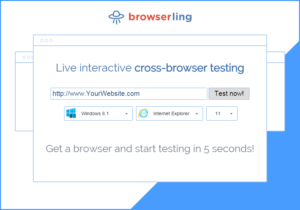 Here’s how Browserling works: You go to browserling.com, choose a browser, enter web address to test, press “Test now!” button and you get a real, fully interactive browser. You can resize it, use developer tools, capture screenshots, annotate screenshots, tunnel it to your local development environment for local testing, do responsive testing, and much more. It offers Android testing as well and iOS and OSX testing is coming soon! Browserling also offers browser extensions for Chrome, Firefox, Safari, Opera (and Internet Explorer soon). The extensions let you do cross-browser testing from your browser’s toolbar with just one click. You can also user Browserling’s bookmarklets to bookmark your favorite browsers. Then you can access them with one click from your bookmarks. Browserling is a serious company with over 15,000 users, including huge companies such as Iris Couch, and NHS, UK’s National Health Service. Give it a try and also check out their own webcomic about web developers. It’s hilarious!